Recently, HP introduced two new DreamColor displays, the Z31x which will be available for purchase later this year, and the Z24x G2 which is the subject of this review (and is available today). If you are interested in learning more about the upcoming Z31x, an advanced, 4K, high-end, feature-rich display which has a built in colorimeter, check out this story from earlier this year. For those of you who are unaware, DreamColor is HP’s line of 10-bit color calibrated displays that are specifically made for those who work in color critical environments such as digital matte painting, color grading, 3D animation, visual effects, photo-retouching, editing and graphic design. In the field of post-production, according to HP, DreamColor displays have been used by 80% of Academy Award nominees and in animated pictures, top animation studios count on HP DreamColor displays for their work. In fact, in 2015 HP won an Academy Award for DreamColor, the only computer company to ever win a Scientific and Engineering Award for a display. In the box, along with the display itself, there’s a CD with drivers and manuals, power chord, Displayport cable, DVI cable, and a USB upstream cable. There’s also a printed factory calibration report which contains details about the color calibration of the unit. The page contains the date of calibration, as well as the exact calibration and validation equipment that was used. There are also graphs for the sRGB Calibrated Gamut which the Z24x has 100% coverage of, the Adobe Calibrated Gamut for which it has 99% of, sRGB Color Checker, AdobeRGB ColorChecker, Gamma Log and Grayscale Tracking. 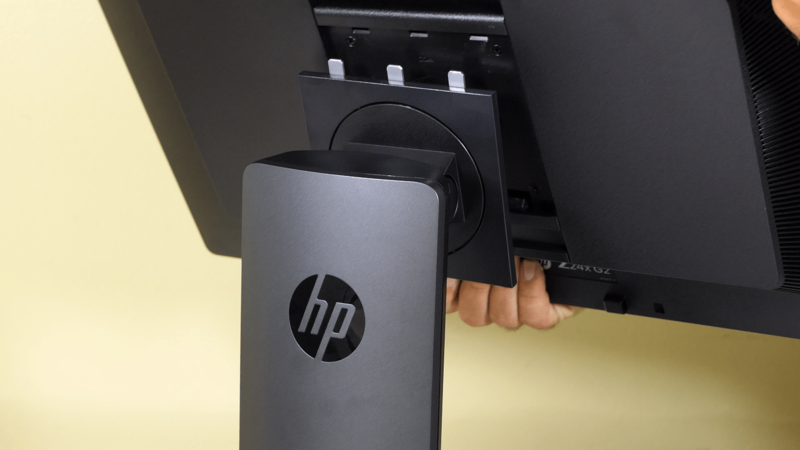 The factory calibration report that comes with the HP Z24x. The HP DreamColor Z24x G2 can be calibrated to four standard presets, sRGB, Adobe RGB, BT 709, and User. You can even create a custom color space and calibrate to that if you prefer. 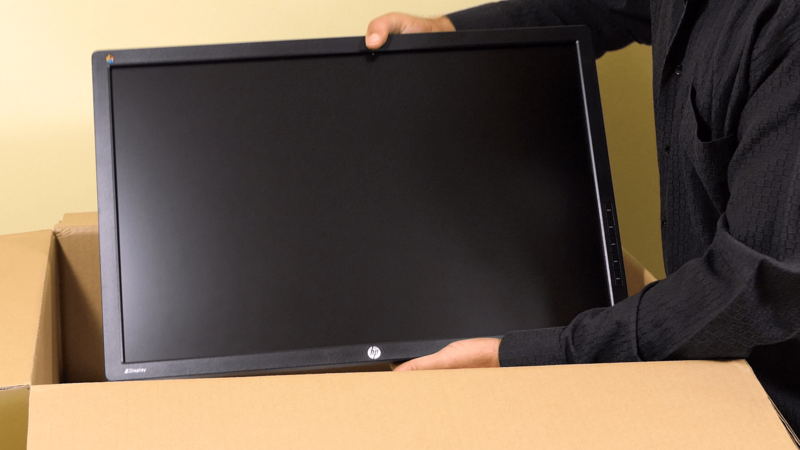 Taking the HP Z24x G2 display panel out of the box. Importantly, the Z24x is a 10 bit color panel. That means it delivers 1,024 levels per RGB channel resulting in over a billion colors. 8-bit color panels, by contrast, only offer 256 levels and 16.7 million colors. With 10-bit color, therefore, you get less banding and smoother color transitions in your images. The base is strong, handsome and sturdy enough to support the Z24x display. You can also swivel it around to face it towards different angles. Putting the Z24x DreamColor display onto it’s base. 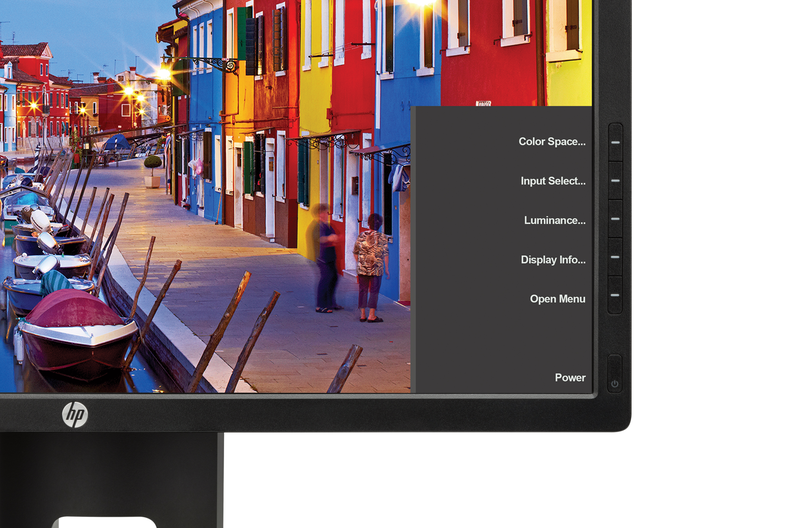 The HP Z24x G2 DreamColor display is solid with a quality build that will fit into high-end design and edit suites. In fact, it’s a perfect machine to use as an edit monitor. Your timelines and palettes can be on one display while you accurately preview your final picture on the Z24x. 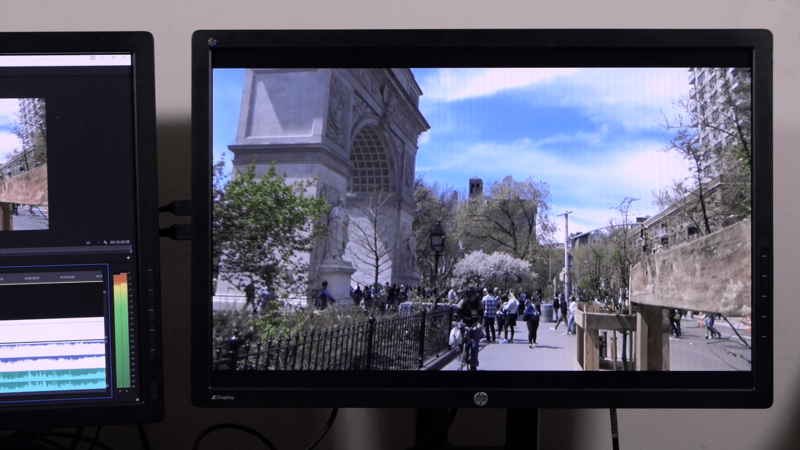 The HP Z24x G2 DreamColor display functions great as an edit monitor. Another nifty feature about the Z24x Dreamcolor display is that you can rotate it ninety degrees and work in portrait mode or landscape mode, a feature that can be useful for photo-retouchers or digital painters. Rotating the display also gives you easy access to the ports. You can rotate the display 90 degrees on its base. On the side of the display are two more USB 3.0 ports. Together with the two on the bottom, that brings the total amount of USB ports to four. Right behind them is an easy access panel that slides out which contains important information about the display for your reference, or in case you ever need to contact technical support. The ports on the bottom of the HP DreamColor Z24x G2 Display. 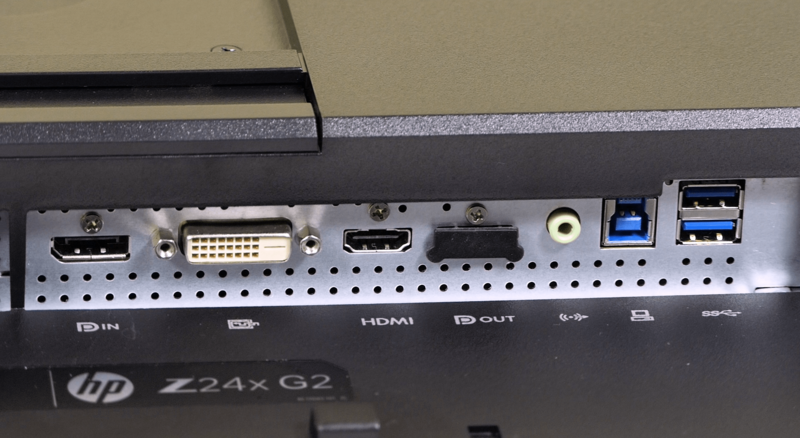 On the bottom of the panel, there’s two USB 3.0 inputs and one upstream port for connecting to the computer. Next is an audio output jack, HDMI port, DVI port, Displayport, AC input and power switch. The weight of the Z24x is 15.4 pounds with the stand. Menu buttons to set the color space and other adjustments. Above the power button are the menu buttons which allow you to set up the different color modes and make other important manual adjustments to the display. 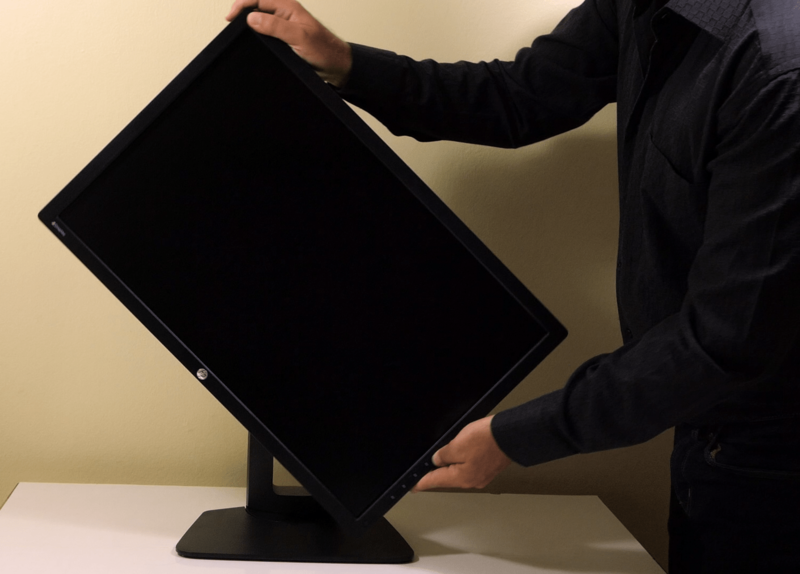 The HP Z24x has a wide viewing angle of 178 degrees horizontal and vertical, a 16:10 aspect ratio and a resolution of 1920 X 1200 at 60 Hz (WUXGA). It officially retails for $559 but was listed at an affordable price $489 online at the time of this writing. 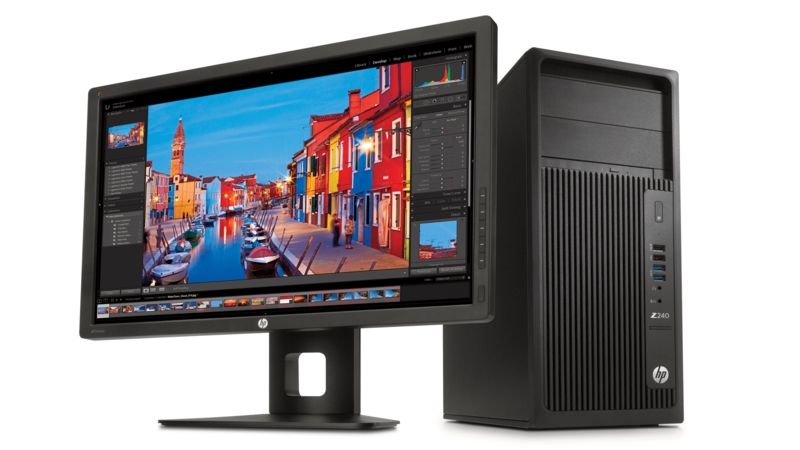 The HP DreamColor Z24x G2 pictured with an entry level Z240 workstation. In conclusion, the HP DreamColor Z4x G2 Display is a capable and affordable 10-bit, user calibrated, color accurate 10-bit display that artists, animators, filmmakers and anyone else who desires true color accuracy are sure to appreciate.